Raw chocolate, cacao nibs and almonds, to serve. Grease 4 ramekins with coconut oil. To make removal of the cheesecakes easier, line with 2 strips of baking paper, creating tabs that can be gently pulled. Place all base ingredients in a high-speed blender. Blend until combined. Add a dash of water if necessary. Press the base mixture into the 4 ramekins. Place in the freezer. Into the cleaned blender, place all the caramel filling ingredients. Blend for about 5 minutes on high speed or until extremely creamy. Pour on top of the chocolate base. Allow to set for about 2 hours. 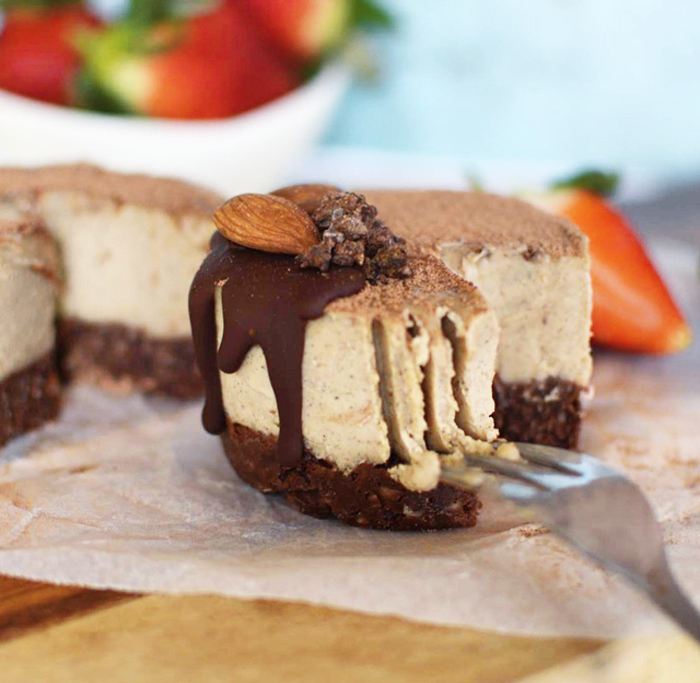 Drizzle with melted raw chocolate and decorate with almonds and cacao nibs!